Hundreds of Burmese nationalists and Buddhist monks marched on the U.S. embassy in Myanmar on Thursday to vent their anger over a name. A week earlier, at least 21 people died in a boat accident in Myanmar’s western Rakhine state. Crucially, these people were from the Rohingya ethnic group — Myanmar’s persecuted Muslim minority. Waving placards and listening to speeches, the 300 protesters were not angry about the conditions had led to the people, including nine children, dying in a boat accident as they made their way from their IDP (internally displaced persons) camp home to a market. Their bandanas read “No Rohingya” and they were complaining against the use of this term, by the U.S. embassy in a statement commiserating the deaths. “We want to declare to the U.S. embassy and the ambassador to Myanmar, and to all the other countries, there are no Rohingya in our country,” a Buddhist monk, Parmaukkha, from the Ma Ba Tha group told the crowd outside the embassy compound. The use of the term “Rohingya” is a contested one. It is widely used outside Myanmar to describe the Muslim minority of more than one million people. But inside Buddhist-majority Myanmar, also known as Burma, it is rejected by many who describe the group as “illegal Bengali migrants.” The Rohingya ethnicity can be traced back hundreds of years in Myanmar, but they are not recognized by the Burmese government as one of the country’s official ethnic groups. The Rohingya people are often described as one of the “most persecuted” ethnic groups in the world. Following communal violence in 2012, around 120,000 Rohingya remain in IDP camps. They are denied freedom of movement and access to adequate healthcare, education and jobs. Those outside the camps fare no better. They are also kept contained in their villages and denied freedom of movement. Last week’s tragedy occurred when a group of 60 Rohingya traveled by boat from their homes in the Sin Tet Maw camp to Rakhine’s state capital Sittwe to buy food. Restrictions meant they were not permitted to travel by road. They had nearly reached their destination when the boat capsized. In response to the incident, the U.S. embassy released a statement expressing its concern and sadness. Outraged at the statement, around 250 members of the Myanmar National Network — a nationalist youth group accused of promoting anti-Muslim sentiment — descended on the U.S. embassy. 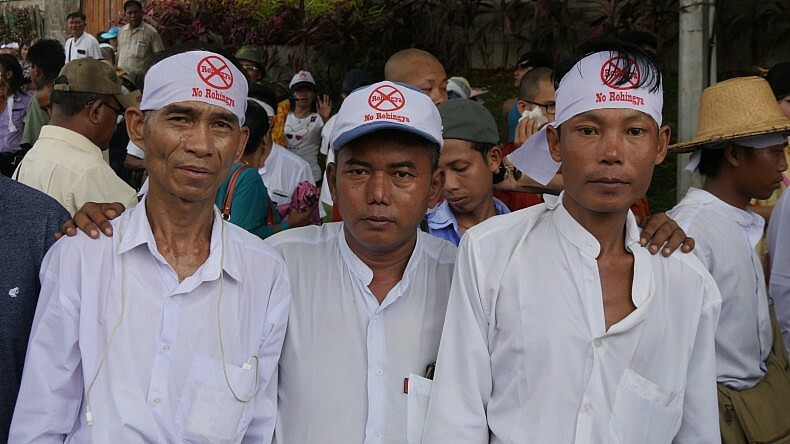 They were joined by around 50 Buddhist monks from the hardline Ma Ba Tha organization, also known as the Association for the Protection of Race and Religion. The Myanmar National Network has been accused of touring Burmese villages to “educate” children about Islam — including getting pupils to recite lists of the crimes carried out in the name of Islam. Myanmar National Network leader Ko Win Ko Ko Latt handed a letter to security guards at the compound gate. Speaking to the media, U.S. Ambassador to Myanmar Scot Marciel said he hoped people would focus on the message of condolence rather than the name used. “The normal U.S. practice and the normal international practice is that communities anywhere have the ability to decide what they are going to be called,” he said. 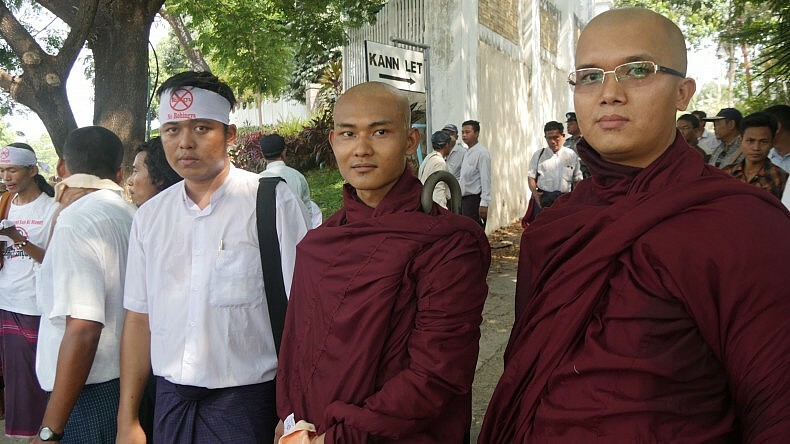 Thursday’s protest is not the only example of simmering religious tensions in Myanmar. Two weeks ago Buddhist monks threw Muslim vendors out of the Shwedagon Pagoda, Myanmar’s most revered Buddhist site. Vendors are a common feature of pagodas across the country. 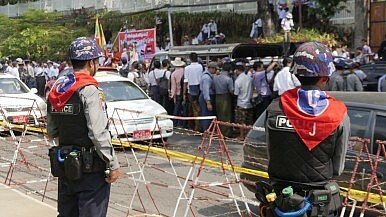 Two days later a Muslim taxi driver was beaten after driving past the pagoda. In response to these incidents, a group of youth organized an “anti-nationalist” protest in downtown Yangon. But unlike the rally at the U.S. Embassy, the anti-racism demonstrators felt they had to wear masks to escape reprisals. The “Rohingya issue” is a thorny one for the new government, led by Aung San Suu Kyi’s National League for Democracy. Ma Ba Tha monks warned before last year’s election that an NLD government would lead to an “Islamification” of the country. Such religious campaigning was the reason, it is believed, why the NLD did not field a single Muslim candidate in the elections. The Rohingya themselves were barred from voting in the election and their identity cards were taken away from them. But Aung San Suu Kyi did not refer directly to them once during campaigning — and any hopes that an election victory for the human rights icon would change the situation for the minority group have not borne fruit. The international community was horrified in the early part of last year to see 31,000 desperate Rohingya people flee the country in rickety boats, often at the hands of people traffickers, and has been calling for greater action ever since — to little avail within Myanmar. On April 14, the U.S. Commission on International Religious Freedom called on the Burmese administration “take steps” to protect religious freedom and belief in Myanmar — specifically citing the hardships facing the Rohingya. “One such step is Burma’s government radically changing its abusive policies and practices in Rakhine State, which have harmed members of the ethnic communities who live there, especially Rohingya Muslims,” the U.S. government agency said. But while many want to see action for the Rohingya, Myanmar is a country with many problems — from ongoing ethnic conflicts to poverty — and the message from senior NLD figures has been that their plight is not a priority. When asked to comment on this, a spokesperson for the National League for Democracy refused. “I don’t want to answer this question,” he said. David Doyle is a freelance, multimedia journalist based in Yangon, Myanmar, with extensive experience in foreign affairs and political reporting. Images of one Rohingya village in Myanmar and one Rohingya refugee camp in Bangladesh before and after the crackdown.